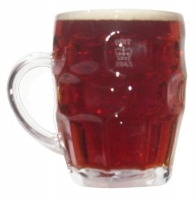 Each of our authentic 10 and 20 ounce English pint glasses are imported and display the original British government stamp as was in use prior to England joining the European Union. The government stamp is sand blasted into the glass and will never fade nor wear away. In stock and available for immediate delivery.